At dusk, the normally bustling docks of Port Jefferson are soothingly calm. Port Jefferson is a beautiful, historic town located on the North Shore of Long Island where the smell of salt in the air and the sound of the Long Island Ferry is never too far in the distance. This waterfront town was settled in the 1600s as a rural town, but transitioned into a shipbuilding center in the 1800s. Many of the historic buildings and homes still standing in Port Jefferson belonged to prominent sailors and shipbuilders in the area. Visitors to the town can still take in a slice of history at buildings like the Village Center. The Village Center was formerly a shipyard, where builders worked tirelessly to create and immediately launch ships into the Long Island Sound. 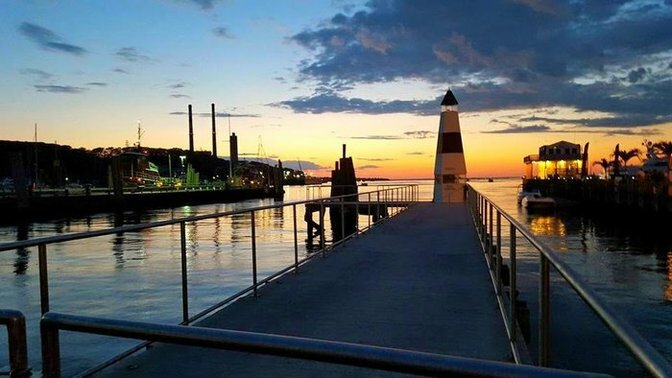 Today, Port Jefferson is widely known as a popular tourist spot in Suffolk County, as well as a transport hub thanks to the Bridgeport and Port Jefferson Steamboat Company, which takes hundreds of passengers to and from Connecticut each day. Port Jeff is busiest in the summer, but it also draws many tourists for unique events like the Charles Dickens Festival, which is held every December. 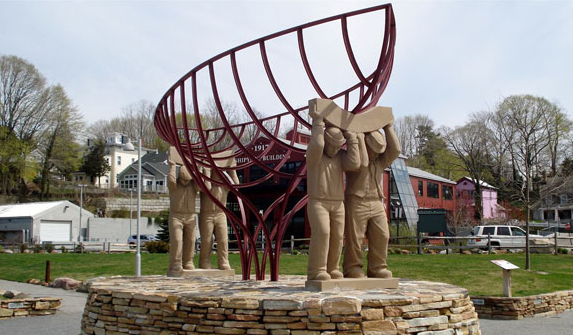 A statue in recognition of Port Jefferson's ship building history. What makes Port Jefferson so popular is not just its beautiful waterfront views, but also the accessibility of the shops, restaurants, and resources in the town. You don’t have to walk far in the Village to find great places to go shopping, grab a bite to eat, or get a cup of coffee. 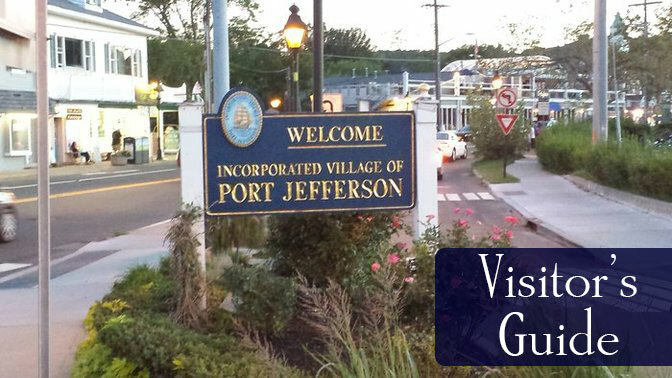 Port Jeff is also kid-friendly and pet-friendly, so you can feel free to bring all of the family to explore the town. Here are some local hot spots to discover in this great walk around town! The Bridgeport & Port Jefferson Steamboat Company is the quickest and easiest way to get to and from Connecticut. When you drive or walk on to the ferry, you can cross the Long Island Sound in just over an hour. Fares depend on the mode of transportation you are using when boarding the ferry, as well as how many people are in your vehicle. 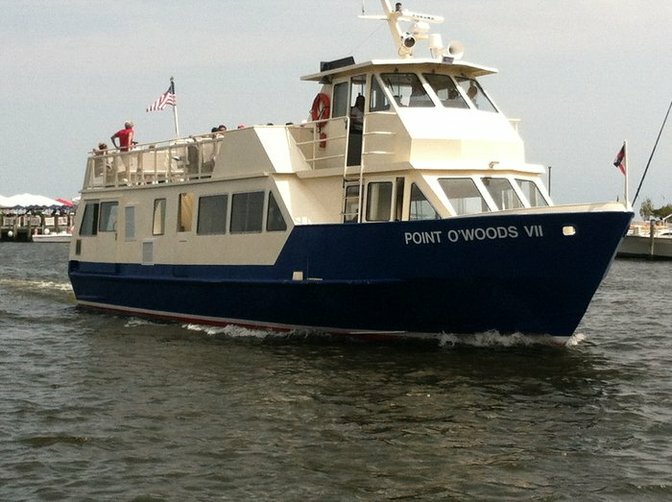 Point O'Woods VII ferry returning from Fire Island. For more information about when to catch the Long Island Ferry, check out our Long Island Ferry Schedule Guide! Port Jeff is a very kid-friendly neighborhood for locals and tourists alike. It is home to Long Island’s premiere hands-on constructivist science museum for children, and it also has lots of areas to explore and outdoor activities for kids. Take a quick walk to one of Port Jefferson’s great parks for kids and let them loose to swing, climb, and run. Our Lady of Wisdom Regional School hosts this science group for kids, which offers various after-school and summer programs for kids ages 5-11. Destination science places importance upon STEM (science, technology, engineering and math) learning, skills that will be invaluable for their future. This summer camp will leave kids with a life long love for learning. Located right on the beautiful Long Island Sound, this hands-on children’s museum encourages kids of all ages to learn by playing, constructing, and experimenting. Experienced teachers are on hand to guide children through a new science, engineering, or math explorations every week. During winter, kids and adults alike can rent skates or bring their own to ice skate right by the water. The Rinx is now opening the rink as a roller skating rink for the spring and summer. Also known as Rocket Ship Park, this park has lots of swings, climbing equipment, a basketball court, three tennis courts, and a large picnic area. Port Jeff’s park right on the water is a great place to throw a Frisbee, play a game of catch, or just run around on the lush green grass. Lainie’s Way offers unique toys, games, and construction sets for kids of all ages. This gem of a toy store has the widest array of toys you’ll find anywhere on Long Island. Contact LI Helium for any helium balloon orders for your kids party or other special event. Each tank will be delivered and picked up from the event location, thus resolving any transportation issues. Named for the ancestral hometown of the DeNicolas family, this restaurant draws from its roots in the South of Italy. Ruvo brings elegant Italian dining to Port Jefferson with classic Italian dishes in a welcoming atmosphere. The Ruvo is family owned and operated, contributing to a family friendly atmosphere. If you're looking for a delightful evening, gather up your family and friends and head to Ruvo. You'll experience an evening of fine dining and exotic cuisine right here in Port Jefferson. Fresh local ingredients come together to make unique dishes and drinks in an elegant yet casual atmosphere. Be sure to stop in for their great happy hour specials. Tiger Lily is a great stop for brunch or lunch, and has an extensive list of unique wraps, as well as vegetarian and vegan options. Check out their tasty smoothie and juice bar! Toast is a relaxed coffeehouse and lunch spot by day, and a happening craft beer and live music venue by night. For more great restaurants located in Port Jefferson, check out our Port Jefferson Restaurants Guide! If you’re a fan of the arts, Port Jeff is the place for you! In the village, there are several art galleries within walking distance that have art on display for show and for sale. You can also catch a local Broadway show at Port Jefferson’s famed Theatre Three – the best in small theater experiences! The exhibits at the Port Jefferson Village Center will satisfy any art lover. A night on the town wouldn’t be complete without the theatre, so treat yourself and your date to a concert, play, comedy, or Broadway show. The theatre also specializes in children’s shows earlier in the day. The Village Center hosts a rotating art gallery on the second floor mezzanine, which include historic photos of the area, works from renowned artists, and even photos submitted by locals. This fine art gallery features works from local and international artists. Artisan Direct is home to the works of emergent artists from across the country and around the world. Admission is always free and it is open year-round. This gallery is your place for official Thomas Kinkade limited edition artwork, which largely focuses on landscapes and Americana. 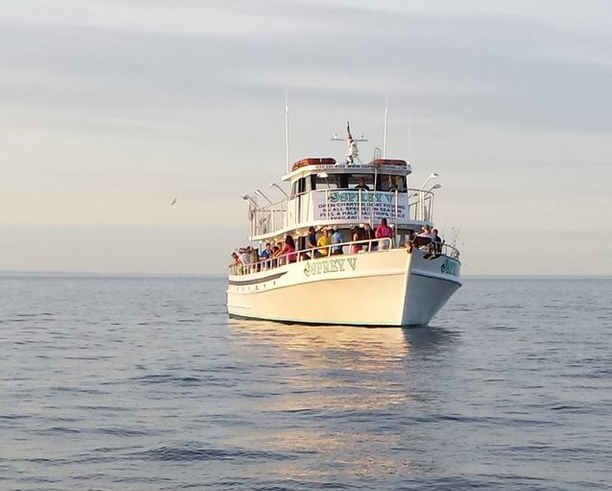 There is plenty to do on the Long Island Sound, and one of the most popular activities in town is to go enjoy the water by fishing or swimming. Grab a group of friends and family and spend a day on the Sound catching fish and enjoying great company! Here are some local fishing and nautical groups for your next excursion. The charter boat, Osprey V returns from a day at sea. Photo courtesy of Osprey Fishing. Grab your fishing pole and hop aboard Celtic Quest’s recently updated charter ships, which are now complete with top of the line fishing electronics. If you're in the mood for cool breezes and sunshine, hop up on the large sun deck, it's perfect for parties and cruises. Whether you're interested in a day of fishing, catching some rays, or enjoying a celebration, the Celtic Quest is the charter for you. The staff on this family-run party fishing boat have a wealth of experience to impart on their fishing people to help you land a big catch! Don't worry if it's your first time fishing, the crew will be happy to show you the ropes and they will make you sea worthy in no time at all. This 65' ft charter will take you out on beautiful waters off the the coast of Long Island. Get ready for an exciting day full of fun activities and exciting experiences. If you're interested in scuba diving, come to this service and sales center for all things scuba. You can even join a class or schedule private lessons! Do a bit of boat shopping or just check out the newest Malibu boats, or buy your own wakeboard and take a class on the open water! Port Jeff is always hopping – day and night! Bars and pubs alike stay open until the wee hours of the morning. Live music can often be found at bars or other venues in Port Jefferson, so get ready to eat, drink, and be merry at these local hot spots. 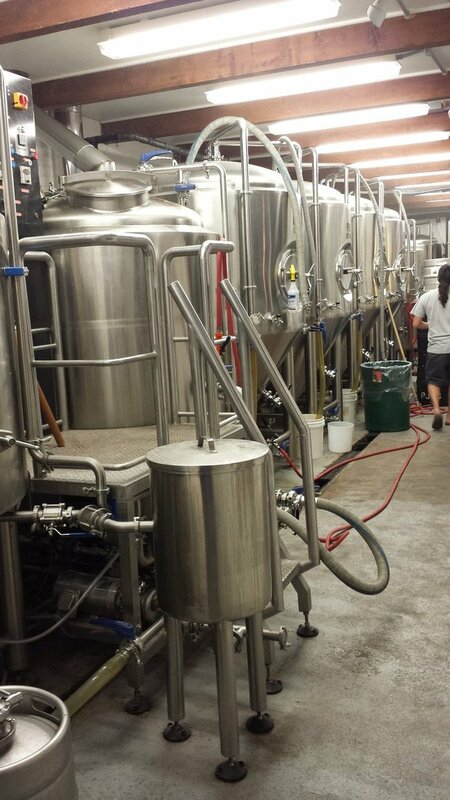 A glimpse behind the scenes at one of Port Jefferson's famous breweries. Savor the taste of small-batch craft beers at Port Jeff's only brewery with local flavors such as Schooner Pale Ale and Port Jeff Porter. Tommy’s place has the classic late night sports bar experience with plenty of beer and wing specials. Tara’s is known for having incredibly cheap food and incredible happy hour deals to keep its patrons ordering all night. Though Schafer’s is best known as a seafood restaurant, when the sun sets, it becomes a hot spot for dancing and live music. The Arden is a new restaurant and lounge with a late night bar and dance floor. Spycoast is a small late-night bar with booming music and sports games on the televisions. If you’re looking to vacation in Port Jefferson or just stay for a weekend to get away from it all, there are plenty of places to stay. In addition to the main hotel in town, there are numerous bed and breakfasts in the surrounding area that are off of the main drag in more secluded and quiet neighborhoods. Enjoy all of the nautical and historic buildings and scenery that Port Jeff has to offer! A beautiful sunset to end a wonderful day in Port Jefferson. Photo by LongIsland.com reader Michele Fasano. This upscale hotel experience offers beautiful waterfront views in walking distance of all of the best restaurants and hot spots. Quaint and historical is the theme at the Ransome Inn, which was built in 1868 and is tucked away from the bustle of the Village. The Golden Pineapple is a charming B&B on a quiet side street in Port Jeff overlooking beautifully manicured gardens. If you're looking to plan a day trip or an extended visit to Port Jefferson, you can reach the town by taking the Long Island Expressway to Exit 64 and traveling north on Route 112 to the end. You can also reach the town by taking Middle Country Road/Route 25 or Nesconset Highway/Route 347 and heading north on Route 112. The LIRR can also drop you off in town at the Port Jefferson LIRR Station, athough you would have to call a taxi if you were planning on going to the village, which is about 9 miles away. If you're looking for fun things to do in other great places on Long Island, check out our other Guides for Sag Harbor, The Hamptons, Northport, Greenport, Ocean Beach, FIre Island, Freeport, Montauk and North Fork!